Harlequins: Chisholm; Yarde, Hopper, Sloan, Walker; Evans (c), Tebaldi; Lambert, Buchanan, Sinckler; Merrick, Horwill; Luamanu, Wallace, Easter. Replacements: Gray, Evans, Collier, Matthews, Ward, Waters, Botica, Swiel. 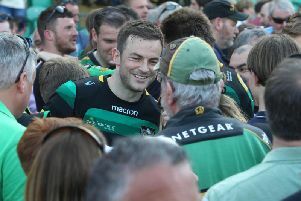 Saints: Foden; K Pisi, Burrell, Mallinder, Elliott; Myler, Dickson (c); A Waller, Haywood, Brookes; Craig, Day; Gibson, Wood, Dickinson. Replacements: Marshall, E Waller, Denman, Matfield, Harrison, Hanrahan, Kessell, Wilson. Outs: Saints: Clark (shoulder), Fotuali’i (hamstring), Hartley, Hill, Lawes, North (international duty). Tom’s preview: The next game is always the biggest game. That is the regularly-used cliché that you will hear from sportsmen and women everywhere when they want to disguise the significance of the upcoming fixture. But there is no downplaying the importance of this weekend’s clash at The Stoop for Saints. Lose, and they will face a mountain that even the greatest climber would not want to scale. Win, and they can drag Harlequins back into the mix, closing the gap to the top four. This really is the biggest league game of the season so far. And its meaning is only accentuated by last week’s shocking showing against Wasps. Saints simply weren’t at the races for the first 30 minutes of that match, shipping three tries on a sobering night at Franklin’s Gardens. But they have acquired a habit of bouncing back from big defeats in recent years. And they will need to do it again this weekend. A big defeat could see them as much as 15 points adrift of Harlequins come the close of play on Saturday. And even though there will still be another half of the season to go - 11 league games in total - that gap would probably prove too wide. So Saints will know this weekend is a chance to right a few wrongs. To make things look a lot better when Sunday comes. And despite the Wasps woe, they have every reason to be confident. Firstly, Harlequins are shorn of a plenthora of Six Nations stars. While Saints are without Dylan Hartley, Paul Hill, Courtney Lawes and George North, Quins have endured even more disruption. They have five men in the England squad that faces Scotland on Saturday, and they have also lost their own Wales star, with Jamie Roberts heading off to represent his country. Conor O’Shea’s side have lost their past two games, with last Sunday’s defeat at Newcastle preceded by a big loss at Montpellier. And they have not won any of their past five meetings with Saints, who have likes of Kieran Brookes, Tom Wood and Luther Burrell available this weekend. It should be a great chance for Jim Mallinder’s men to make hay during the Six Nations, as they have so often in recent seasons. During the 2015 tournament, they won three of their four league games, drawing the other. In 2014, they enjoyed four wins from four Premiership games, while a year earlier, they won three of their four matches. Prior to that, they had a mixed record and in 2011, the season in which they reached the Heineken Cup final, they only won one of their five matches during the Six Nations. During that time, they were battered at Bath and eviscerated at Exeter. So they have clearly come a long way, with their squad far stronger these days. And if ever there was a good time to face Quins, it would appear to be now. But the same could also have been said about squaring up a Wasps team missing the likes of Joe Launchbury, Joe Simpson and Christian Wade last Friday. Nevertheless, if Saints can show more character and get their skill levels back to where they were when topping the league table last season, they can win this weekend. And how welcome that would be for everyone of a green, black and gold persuasion.